Timely access to primary care after a hospital visit is critical to managing and improving patients’ health. The 7-Day Pledge is a citywide program that aims to reduce avoidable hospitalizations in Camden by removing barriers to rapid primary care follow-up after patients are discharged from the hospital. Approximately one-quarter of hospital readmissions are preventable, and inadequate post-discharge follow-up is a key factor in many of these situations. 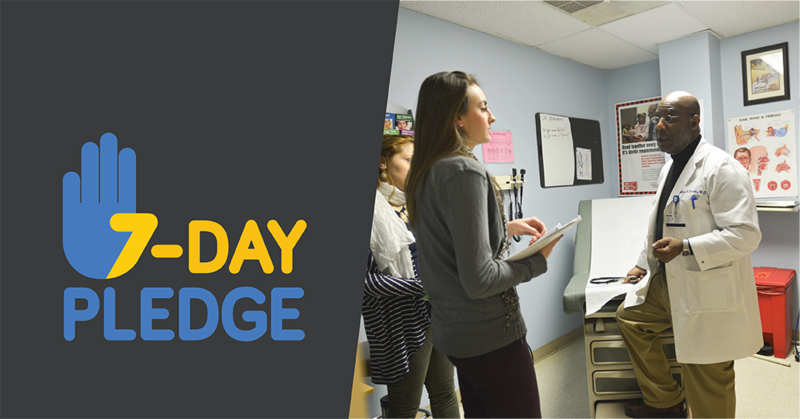 By facilitating connections to primary care, the 7-Day Pledge program ensures that patients receive necessary care within seven days after leaving the hospital. In an article published in the American Medical Association’s JAMA Network Open journal in January 2019, we shared results of our 7-Day Pledge evaluation. We found that patients who had primary care appointments within seven days of hospital discharge had significantly lower numbers of 30- and 90-day hospital readmissions. The Camden Coalition implements the 7-Day Pledge program in collaboration with partners throughout Camden and the surrounding areas, including the following primary care practices: CAMcare, Cooper Ambulatory Pediatrics, Cooper Internal Medicine, Cooper Family Medicine, Fairview Village Family Practice, Osborn Family Health Center, Project H.O.P.E., Reliance Medical Group, and Virtua Primary Care. We also partner with Cooper University Health Care, Jefferson Health’s three New Jersey hospitals, Lourdes Health System, and Virtua Health through the Camden Coalition Health Information Exchange, which provides us with the data we need to run the 7-Day Pledge. Read our blog post about our 7-Day Pledge evaluation.